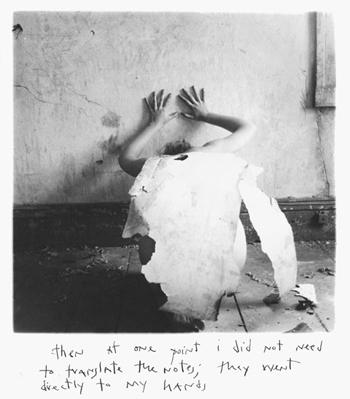 A new exhibition of the photographer Francesca Woodman has opened at the Victoria Miro gallery in London. I first saw Woodman’s work at the Tate Modern a few years ago and it has stayed with me ever since. Her photographs are mostly black and white, in an empty room often inhabited by a single figure. They are beautiful images in their own right, but there is also a whole lot more going on under the surface. I found myself pondering several of the photographs on display for some time. This is partly a habit I picked up from a childhood being taken to art galleries – memories I still treasure. But it was also down to these small, outwardly simple images incorporating many themes and feelings, at least for me. So, I hope, dear reader, you’ll permit me a little pseudo-intellectual discussion of her work. I won’t keep you long. Francesca Woodman was dead at 22. And much like with other artists who died young, this lingers over her work. In fact, it would be easy to draw parallels in her work with another young suicide, Joy Division’s Ian Curtis. Some of the photographs would not look out-of-place on a Joy Division record sleeve, and there is a similar sense of decaying space and isolation, the echoes of people barely there. It is always hard to experience art at a stage removed from the context of the artist’s life, even through nobody’s life or work should necessarily be framed entirely by one event. But an event as violent and shocking as suicide will inevitably cast shadows. Sometimes it is hard to step back and acknowledge that the artist wasn’t working towards the moment of their death. They shouldn’t be defined by it (or any other single moment of their life, for that matter). Yet, we can’t help attach meaning to it and their work. Or even make comparisons like my Woodman/Curtis one above. Would I have come to that conclusion if Woodman and Curtis were still alive? Perhaps. But their circumstances made it a simpler comparison to draw. In this case it probably belittles the work too, to some extent, as there is so much more to it. There is a timeless quality to the photographs. The scene is generally a dilapidated, derelict-looking room. Any clothing is vintage, from a time when it wasn’t fashionable. The prominence of black and white helps avoid the shots looking dated too. There is often a gothic quality, without resorting to caricature. Woodman photographs herself under perished tree roots, or bound by cuffs made of bark. Nature is depicted as prison-like, restrictive and unsettling. She is part of nature, consumed by nature, and it doesn’t look like an entirely pleasant experience. Many of the photographs have a surreal quality too. Strange objects are held in front of figures, bodies are contorted into strange shapes, mirrors and doorways dissect and distort. Yet the surreal rarely descends into farce, it is not used for cheap laughs. Instead, it appears to be a mechanism for presenting the self in a dislocated and unlikely way. Portraits figure heavily, and mainly self-portraits. But the figures are generally hard to pin down. They are blurred, or concealed, or mostly out-of-shot. These are almost anti-portraits. The figure is rarely entirely there. This really resonates with me. When we look at someone, how much do we really know about them? When someone sees us, how much to they really get? These portraits seem far more honest, real and human than standard portraiture. We are not static, easy-to-read, on display. We are fleeting. We are changeable. We are unfathomable. It goes without saying that Woodman’s early death was a huge loss. But perhaps it does serve a purpose in understanding these photographs. It focuses the mind on our own presence in the world. We’re there, and then we’re gone, just like the blurred figure in the photograph. That moment, that life lived, life as the fall of a camera shutter, is all too quick, is often impossible to comprehend, but is often so beautiful. I’ve seen one or two of her shots over the years but not known who the photographer was. Sad that she felt there was no life left to live when she was clearly so talented. Anti-portraits is a good term – there is a yearning for anonymity in lots of her work that many modern artists could learn from. Yes, I think so too. I think there is something to explore further about how some artists (of any description) put themselves completely inside their work, while others are far more detached. While I find both fascinating in their own way, I think the real skill is in the latter. Thinking of literature, I have nothing against writers with distictive styles or personalities, but when, for instance, I read about yet another book where the author has made themselves a character, my heart sinks a little. Sometimes the artist can overwhelm and dominate the work itself, so there is no soul or meaning once they have stepped away.